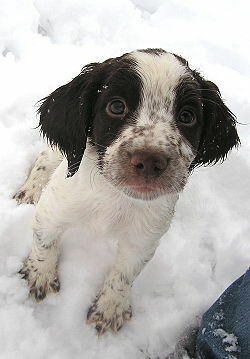 Most everyone who seeks to acquire a pup can read or has heard that the ideal time to get a pup is right at the 49th day. It seems that rumor has it that the ideal bonding takes place at that time. Unfortunately, many resources have led new puppy owners into believing that a puppy purchased at an age older than exactly seven weeks will bond less and be less trainable. Bonding will take place between owner and pup at any age if the upbringing and beginning training is a positive experience. A stimulating environment with some restrictions and play time with constructive learning taking place will enhance a pups mind. 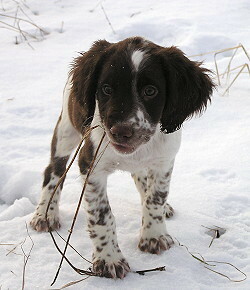 This allows the pup to learn, figure out their place in the pecking order and be set for a "want to do right" mind set. Getting a pup at seven weeks old is still the very earliest we will let a pup go to its new home. It is becoming far more common for us to have new owners wait until ten weeks or older before a new pup goes home. We hear of some instances of owners getting a new pup at six weeks old. This was done because the breeder said he needed to get rid of the pups or they were too much to take care of, not enough room, etc… Whatever the reason, it is not good enough. Pups separated from their littermates prior to seven weeks can end up being poorly developed in their mind. One needs to watch getting pups later than seven weeks old also making sure the pups were not just left in a pen with no human contact or early training. This can develop into a hard to handle dog or a shy reserved pup. A common mistake with pups like these is that people think the pup was beat or hit, but it is more likely just a case of poor socialization. Now that you have the top-notch pup you have always wanted, you can dream about the dog that will listen to you, hunt for you and hang out in the house with you and your family. With those dreams comes a strong commitment for the best care, education and development of your pup into a productive member of your family. The importance of the first few weeks cannot be overlooked. "Pups will develop a pattern of training and the more control you have over it, the more respect the pup will have for you." From the first time the pup nibbles on your fingers and you allow it, to squirming a bit and you let him go, that low growl when you take a sock from him or letting him out of the crate when he cries - these are all training techniques the pup is using on you. It is important that you realize this learning behavior is happening every day. Allowing those small behaviors to develop because they really don’t hurt anyone or anything - the nibbles aren’t serious cuts, the squirming is only happening because he wants to get down or the crying must mean he wants to get out, the low growl is cute - can turn into major confrontations if you attempt a correction when the pup is older, stronger and more determined. By correcting these behaviors the first time they happen, with you being the boss and giving the direction, the pup will learn that the bad behavior is detrimental and good behavior is rewarding. When the pup nibbles on your fingers, hold the muzzle until the pup relaxes and gives up - not before and not while he struggles. If he struggles and you let up, he wins. If he struggles and you hold firmer then let him up, you win. When the pup squirms to get down or away from you and you let him go, he wins. If you hold him through the struggle then let him go, you win. Same thing is true with the whining in the crate. If he cries and you let him out, pup wins. If he cries and you rap on the crate, say "no" or cover it up and don’t let him out, you win. With the crate training, you will then need to let the pup out when it is quiet. Pups will develop a pattern of training and the more control you have over it, the more respect the pup will have for you. None of this requires you to be heavy handed or mean, it is just good positive educational procedure. Make the wrong thing difficult and the right thing easy. From seven weeks on up to five months old is the best learning period for a pup. They learn where they fit in the pecking order, when they can do things, who to trust, who controls their life, where they can walk and how much they can get away with. This is the time when you don’t let them drag you around on a leash and you don’t play tug of war with them. You don’t chase them around the yard or cater to them when they are whining or barking. Instead, you show them that you are their teacher. You do this by showing pup what you want them to do, where we can go, what we can do and when we will do it. You make the wrong things miserable and the right things easy. No freedom to roam and no freedom to get into things you don’t want them into. You teach them that all good things happen when they are around you. By following some basic practical guidelines in puppy reading, you should be able to develop a great gun and family dog. 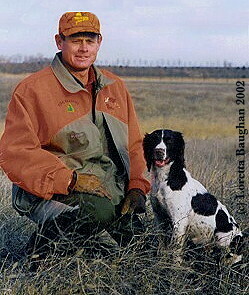 If you are in doubt as to accomplishing this, then consider acquiring a young started dog or a fully trained gun dog.